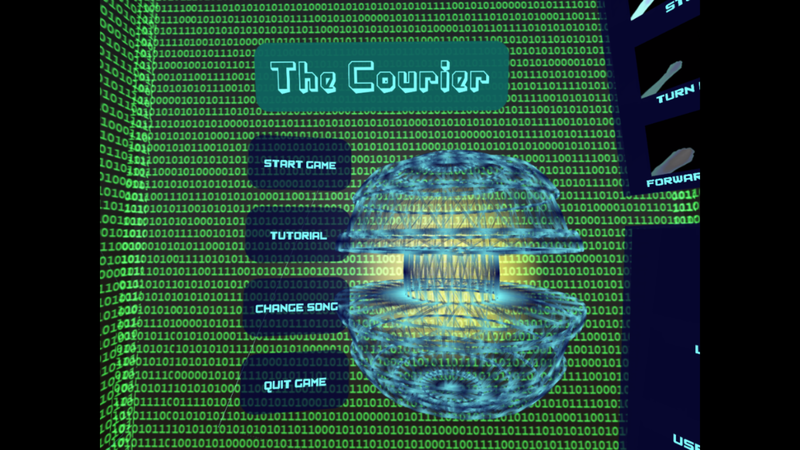 The player acts as a digital courier of user content. 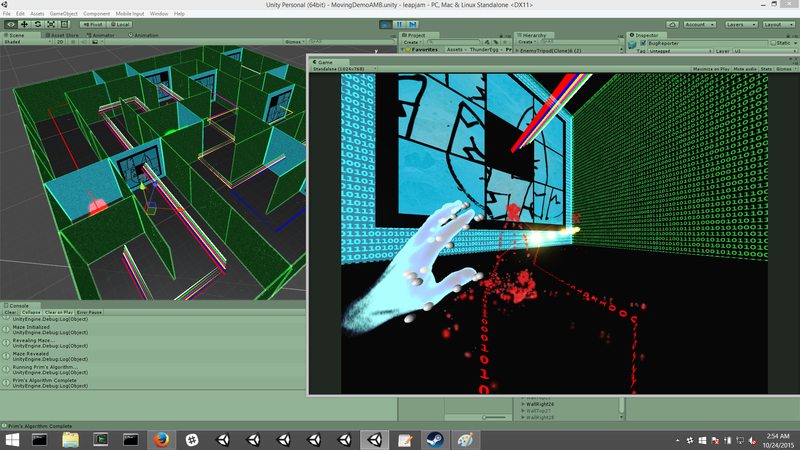 You are given a destination for content and placed inside a procedurally generated maze. 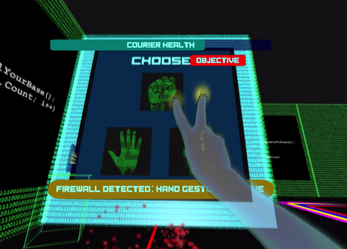 The maze includes enemy virus' as well as puzzle firewalls (scrambled images, connect the dots, match the gesture, rock paper scissors). As you finish upload requests, new firewalls are unlocked and data requests are made. The goal is to deliver all content before your System Integrity is 0%. Every play through will be different as every maze, puzzle, enemy, orb is procedurally generated. So some playthroughs may be easy, hard, repetitive, etc. The firewall puzzles can be changes by walking into the Reset box nearby. In general, an open hand causes an action, and a closed fist causes movement. Hold hands wide open facing away from you. Hold both hands in fists in front of you (like you are holding handle bars to a bicycle). 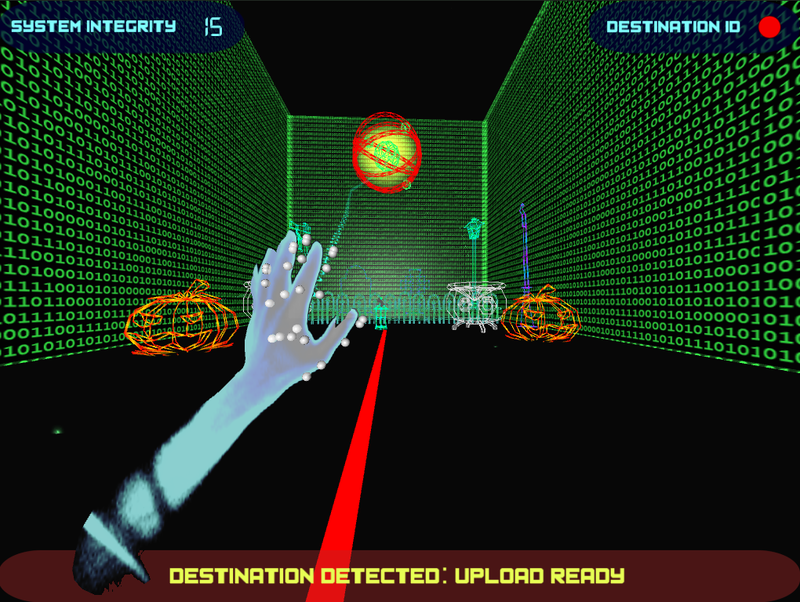 The further away your hands are from the leap device, the faster you move. If you bring your hands in close enough to the leap device, you'll move in reverse. While both hands are in fists in front of you, if you hold your fists at different distances from the leap, you'll turn toward the fist that is closer to the leap. 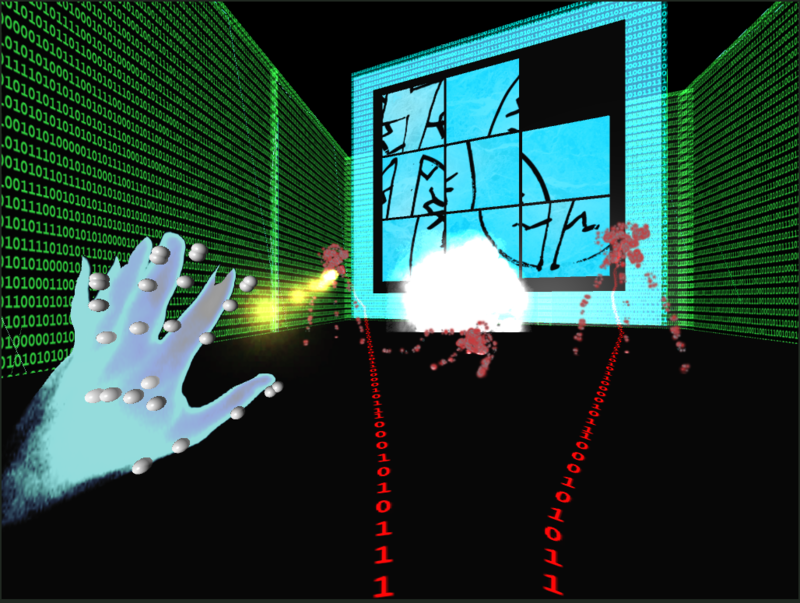 When your anti-virus is active, each open palm will shoot anti-virus orbs. These are used to overcome a virus. Two open palms are move effective. For the 9-slice puzzles, swipe an open hand left, right, up, down (at any location in space) in order to move the puzzle pieces around. For the connect the dots, use the data orbs to hit the puzzle dots. When a dot turns green, you have selected it. For the single gesture, try to match the gesture. Starting from an open hand works best. For the Rock Paper Scissors... well, make a choice and gesture it. When you have reached a destination for upload, an open hand will transfer data to the destination data orb. 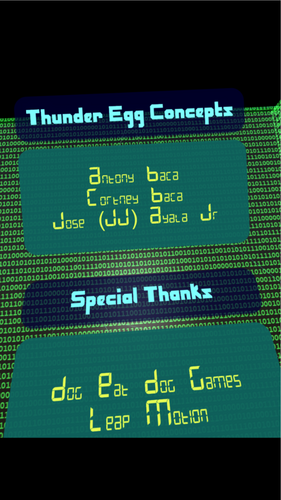 To access the in-level menu, face your palms toward the leap device. 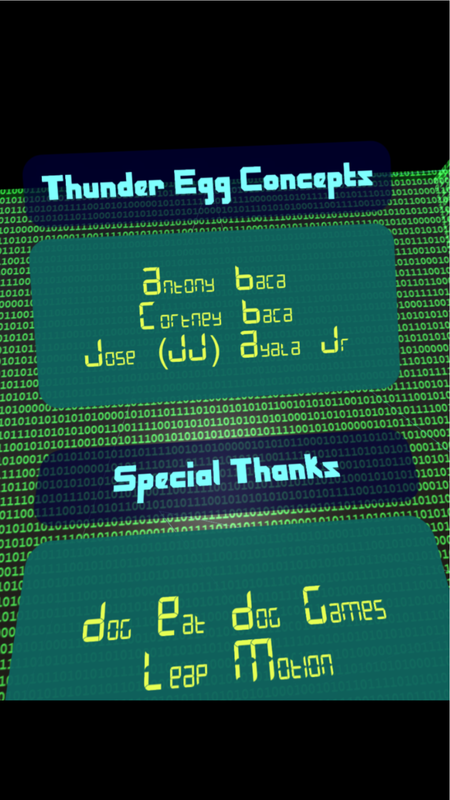 To select an option in the menu, shoot your data orbs at the option of interest. When your anti-virus is active, use the mouse to aim and left click to shoot. 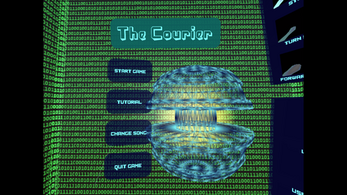 For the 9-slice puzzles, use the arrow keys to move the puzzle pieces around. For the connect the dots, use the mouse to aim and left click to shoot orbs. When you have reached a destination for upload, left click the mouse to transfer data. Use the mouse to aim and left click to shoot orbs at the option of interest.